With his dad long gone and his mother struggling at a low paying job to make ends meet, Tripp (Lucas Till), a high school senior, is on his own most of the time. He keeps to himself at school, and although his classmate Meredith (Jane Levy) would love to get to know him, Tripp is too busy to notice her. When he's not at school, he works at an auto scrap yard, where in his spare time he's building his own truck using bits and pieces of scrapped cars. Tripp discovers something strange one night. Although at first he's frightened of it, he soon comes to realize that the creature with tentacles is actually friendly. A subterranean dweller, the creature was accidentally brought to the surface by an oil company, which is trying to catch him in order to eliminate the evidence. Tripp builds a place into his truck where "Creech," as he dubs the creature, can hide. 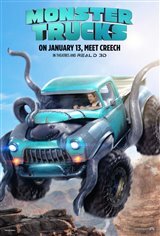 Amazingly, Creech is not only incredibly intelligent, but he can power the truck, allowing it to do superhero feats. The two go on an unforgettable adventure together in order to escape the people who want to harm Creech.